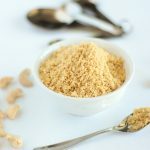 Easy, simple, healthy homemade vegan grated parmesan recipe created with cashews, almond, nutritional yeast, spices, and coconut oil. Place all ingredients in food processor. Pulse until combined and a fine meal has formed.